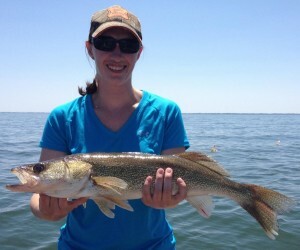 Saginaw Bay is still producing walleye. Catches run from two or three fish per boat to half-limits to the occasional limit catch. Try out near Buoys 1 & 2, general vicinity of the Spark Plug, off the Bay City State Park in the early morning in 10 to 12 feet, in the Slot between Quanicassee and Sand Point in eight to 16 feet or along the west side of the Bar in 20 to 25 feet. Fishing slowed north of the Charity Islands and off Oak Point however a few were caught off the Hat Point Reef. Most of the boats were coming from Port Austin. Saginaw River is still producing the occasional walleye on reef runners and husky jerks in the last two miles of the river. Au Gres Area walleye fishing slowed but anglers were still getting some fish north of Buoys 1 & 2 in 25 feet or off the Saganing Bar in 12 feet. Another contingent would be 30 to 35 feet out near the shipping channel. Au Gres River is currently being dredged. Fishing was slow. Grindstone City walleye fishing slowed as the fish went out to waters 50 to 60 feet which would indicate the thermocline is very deep along the outside of the Thumb. Boats searching for salmon and lake trout seem to confirm this as they were fishing waters 140 to 200 feet to find lake trout. They also caught the odd steelhead and a couple smaller pink salmon. Oscoda had lots of lake trout with fish caught as far north as Greenbush and down to Au Sable Point in waters between 80 and 200 feet deep. Spoons, flies, spin-glows and cut bait in dark colors worked best. Steelhead and salmon were caught but the numbers were down. With the high winds, scum lines have not been able to form. Look for steelhead in the upper third of the water column near the scum lines. Au Sable River has walleye between the mouth and the dam and they are hitting on crawlers, leeches and stick baits. Those fishing up river are targeting the deeper holes. Some large smallmouth bass were also caught. Tawas Area trolling for walleye has been hampered by windy conditions. Walleye action north of the Charity Islands has slowed. 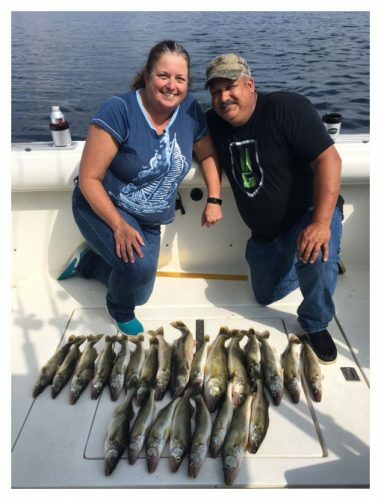 A couple fish were picked up in 25 feet near Alabaster. A couple steelhead and walleye were taken around Buoy #2 and from the weed beds off Jerry’s Marina. Those still-fishing with minnows along those weed beds did catch a few decent perch and a couple pike. Pier fishing was slow with only a few pike, smallmouth bass, rock bass, small perch and a couple bluegills taken. In many of Michigan’s lakes walleye can be a rather elusive sport fish, making the quest for their tasty fillets difficult at times throughout the year. Walleyes are predators that eat a wide range of small baitfish like yellow perch and various minnows, which logically has many anglers targeting these fish with minnows and crank baits. However, walleye also feed on aquatic insects when they are available and using crawlers on crawler harnesses can be an effective technique for working towards a limit. July is a time of year when walleye in many lakes will typically be in depths ranging from 20 to 35 feet where they are feeding on insects or baitfish. During these feeding periods many walleye will be suspended in the water column and trolling a crawler harness at low speeds can be an effective way of hooking these elusive fish. Be sure to check in with your local management units about local fishing opportunities to catch these delicious toothy critters!